Steve B and John E arrived at the Deepdale Backpackers centre first, bathed in beautiful sunshine. Mark B and Vivienne arrived around 5 p.m. followed by Belinda shortly afterwards. We all had wood fired pizzas that were being sold on the grounds, which although is not the normal dinner of champions they were very nice if a, little small. The centre was quite spacious, clean and had a nice kitchen, communal areas indoors and out and separate washing machine area. After dinner we all walked down to the nearby White Horse public house which had lovely views of the sea and the local beer was very nice. Mark H joined us at the pub and we all retired for the evening which was cool but dry. 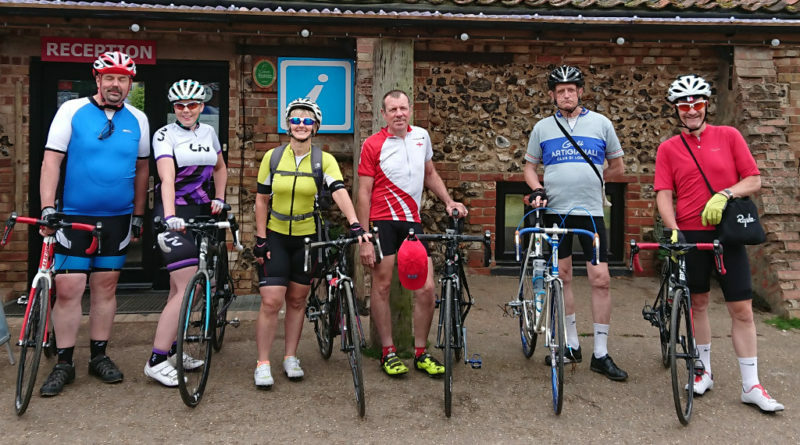 After breakfast all the tourists headed out for a 36 mile ride out to Wells-Next-To-The-Sea via Thornham, Burnham Market and through Holkham House which was lovely, counting cricket on the grounds and a huge lake with many wildfowl as part of its attraction. We lunched in a nice cafe by the sea which was very welcome as it was a bit chilly! After lunch we walked down the sandy beach taking in the lovely scenery and colourful beach huts towards the sea. The sea was a very long way out and so there was much jumping of rivers (caught on video) and watching of sea birds taking fish. After returning to our bikes at the cafe and some more hot chocolate and coffee we set off for home. Mark H needed a cashpoint, what could be easier? If you are in North Norfolk this may well present a slight issue…. On the ride we saw Red Kite, Marsh Harrier, Barnacle geese and Mark Hs personal favourites, sparrows. (Dawn chorus every morning ha ha). We stopped in Burnham Market a very pretty, small town so Mark could use a cashpoint, however there was not an obvious one available. I asked a nice lady where the cashpoints are, her reply was ‘they’re aren’t any here’, I followed up by asking her how they obtained cash to which she looked bemused and shrugged. On we rode until Mark got a puncture, (this may well be a theme) once repaired we got to Lord Horatio Nelsons village of Burnham Thorpe which was interesting to see. For the evening meal we had a lovely lasagna which Belinda had prepared for us all. After dinner we made sure the bikes fitted in the cars for the upcoming Tour of Cambridgeshire and prepared our kit as well for our early start the next day. Viv very kindly gave us all some recovery bars (available at Wallington Cycles, your friendly l. B. S.) then we retired for an early night. We had breakfast around 07:30 for scrambled eggs on toast and then loaded up all our bikes and gear for the Tour, Although we had a bit of last minute shuffling of gear, we were well prepared enough to leave before 09:00 Belinda and me in her car and Steve driving his car with Mark, John and Viv. We arrived at the event around 10:30 for a midday off and were able to register, find more safety pins to apply our Jersey numbers and go to the loo. The drive from Norfolk to Cambridgeshire saw a huge improvement in the weather and it was now very, very warm. We all looked around the bike show and Belinda tried a new bike, lots to see and it was a really nice atmosphere. There were 8,000 riders taking part in the world’s largest and fastest event, encompassing a time trial, Gran Fondo race and Gran Fondo sportive. The riders were divided into average speed and while waiting in the shade mark H had to attend to a rear tyre rip. luckily he was able to get a new inner tube and tyre supplied and fitted by Rutland cycles for £28 and was able to catch up with us. That was mechanical issue number two for Mark. As it was very hot Viv suggested we sat under a tree to wait for the big off, we did unbeknown to us the local itv crew caught us in their shot in the background. Our distinctive Anerley jerseys helped us stand out and it wouldn’t be the first time that day. While waiting under the tree mark had a front tyre explode and he hurriedly swapped it out, that was his third mechanical! The two Marks joined the 20 mph group and the others joined 16 mphs and the atmosphere was really great. We all set off to enjoy the closed roads of Cambridgeshire and there were hundreds of locals out cheering, shaking cowbells, hooting horns, shouting encouragement and kids holding hands out to high five the rides. There were many riders treated at the roadside probably because of the heat. The closed roads provided a fabulous atmosphere to enjoy the lovely scenery with the thousands of other riders. We did notice that most riders were good cyclists and generally fit possibly due to the relatively high cost of entry. The two marks passed Steve and said hi and pushed on past the first of the three available feed stops on the 80 mile route. There were a few shouts of ‘go team Anerley’ from the roadside and there was a conversation overheard saying ‘those two in front of us (the two marks) look good cycling together, they must be a father and son team’. Answers on a postcard about which is which….. Great fast and flat roads with no cars, except the broom wagon and ambulances is an experience I would recommend for any cyclist. John is still recovering from an operation and rode around Cambridgeshire and enjoyed the carnival atmosphere. 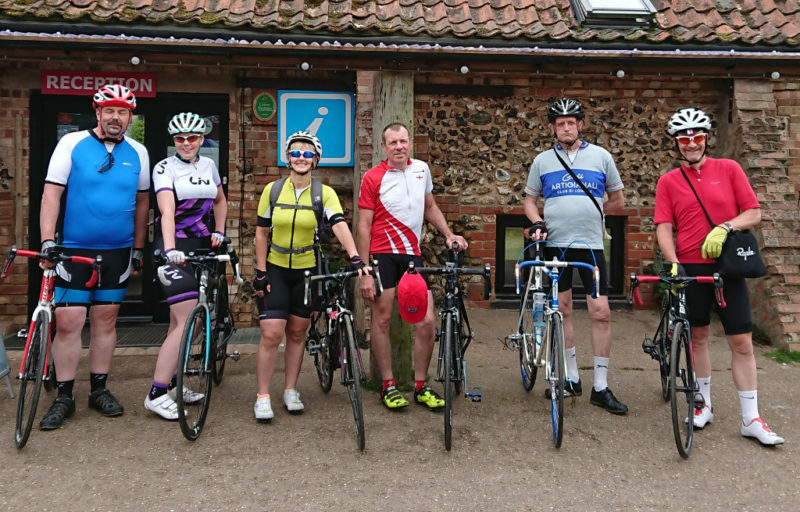 We all met up after finishing and did some stretching and enjoyed a cool drink while consuming our recovery bars (still available at Wallington cycles). Belinda and I headed off ahead of the troops to prepare the evening meal as it was getting late. Belinda cooked a lovely curry dinner and we chatted about what a great event it was. Belinda couldn’t remember where she had put her key but luckily we had an ex-C. I. D officer available to crack the case! Well done Viv! Retired to bed after a fab day. Nice relaxed breakfast after which Steve had to go home to help his wife who’s got a damaged wrist. After an hour of saying goodbye to Steve we said hi to him as he’d forgotten his ice packs, so goodbye again. Belinda followed shortly after as she’s off on holiday and then there were four…. We went for a drive to the aptly named Pretty Corner, which is in a lovely woods with an enchanted cafe in its depths. (might have asked a local how to find the cafe as it wasn’t signposted) It served really nice food complete with friendly dog. After lunch we headed off to Sheringham which is a nice seaside town and we did some shopping. There was a beer shop where we purchased some local beers and put together some of the bottles names to create some amusing stories from their labels ….. The towns motto is Mare Ditat Pinusque Decorat “The sea enriches and the pine adornes” that day the sea was up but the sun did not adorn. It was a lot of fun having ice cream and buying some gifts tho. For the evening meal we went to the Jolly Sailor pub near our temporary home and the food was really tasty washed down with more local beer. Today the Anerley tourists went on a 54 mile run out to Holt. It was a chilly but dry day but the quiet, well maintained roads and respectful drivers more than made up for it. We lunched at Owls tea rooms which offered wholesome food and were very welcoming, even coming outside to show us a safe place to leave our bikes. We returned via Little Walsingham. We popped into the local shop to buy food. Viv and I saw an advert for a bird spotting trip in a binoculars shop window. Unfortunately it was for the day after we left but Viv used her charm to get the shop owner to take us this evening. So we set off with our enthusiastic guide Richard to the Marsh. 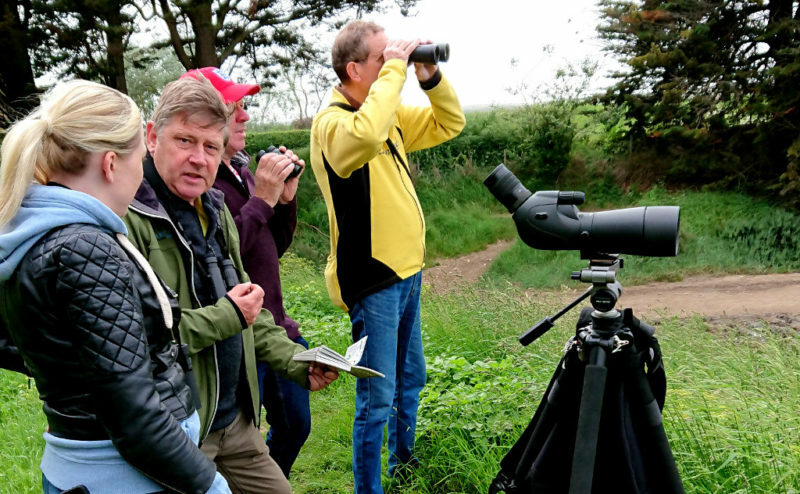 We saw Marsh harriers, chinese water deer, medditeranian gull, shoveler, shell duck, skylark, spoonbill, oyster catcher, black headed gull, red shank, avocet, egret, gadwall and herring gull. This was absolutely amazing and seeing the birds in their natural habitat on a lovely sunny evening was a real privilege. In the evening Viv prepared a lovely pasta meal which we really enjoyed and chatted about Anerley history and the days events. We had breakfast and packed up the cars on a bright breezy day. Before returning home we went to Blakeney Point to go out on a boat seal watching. There were plenty of friendly dogs and our skipper had some well rehearsed banter but the stars of the show were undoubtedly the seals. We were able to observe the seals on the Spit and in the water and enjoy the good weather. After this great trip we returned home in the sun, only a small crash on the motorway casing a delay. 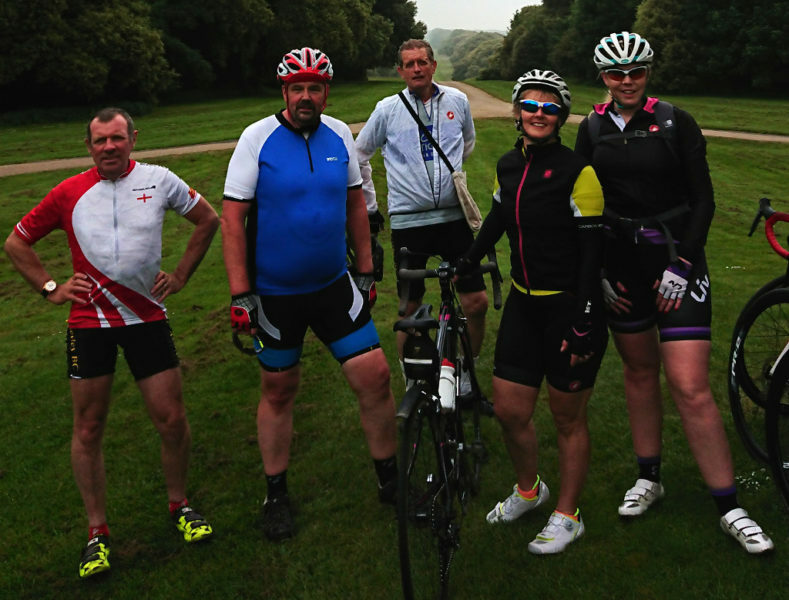 This was a splendid and well organised Tour with plenty of memories and great cycling.